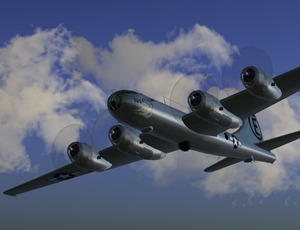 The Boeing B-29 Superfortress was a four-engine propeller powered heavy bomber that was flown by the United States Military in World War II and the Korean War, and by other nations afterwards (Royal Air Force, Royal Australian Air Force). The name "Superfortress" was derived from that of its well-known predecessor, the B-17 Flying Fortress, and carried on a series of names for Boeing-built bombers followed by the B-52 Stratofortress. It was the primary aircraft in the U.S. firebombing campaign against the Empire of Japan in the final months of World War II, and carried the atomic bombs that destroyed Hiroshima and Nagasaki. This page was last modified on 29 July 2016, at 16:13.